The World Health Organization (WHO) through World Health Days draws attention to various medical conditions and other public health concerns. Examples of these include World Malaria, Breast Feeding, AIDS, Blood Donor and Toilet Day to mention a few. World Health Days and the global commemorations associated with them, draw attention to specific health needs and may inform policy decisions regarding highlighted diseases or topics. The Burgundy Ribbon -Official #SickleCellAwareness ribbon. Several variations exist. The Sickle Life Logo. Credit- Sickle Life. The United Nations General Assembly in December 2008, adopted by consensus a resolution to recognise Sickle Cell Anaemia as a public health concern. A major point highlighted was the fact that Sickle Cell Disease affected over a 100 million people globally and when not managed early was often fatal, causing the death of about 50% of people who suffered from the most lethal form of the disease. It was also emphasized that Sickle Cell Disease is a relatively unknown disease among the general public except amongst people who are directly affected by the disease. In recognising Sickle Cell Disease as a public health problem, June 19th was declared World Sickle Cell day in an effort to encourage member countries to increase awareness of Sickle Cell Disease amongst their population. Further, The World Health Organization (WHO) Regional Committee for Africa meeting in 2010 on the theme Sickle Cell Disease: A Strategy for the WHO African Region, also resulted in the formulation of three new targets for Sickle Cell management in Africa by 2020. These emphasize the need for individuals and organizations to work together to increase #SickleCellAwareness and provide opportunities for Sickle Cell Testing and Counselling. Through these actions it is believed the incidence of Sickle Cell Disease can be reduced. As a country (Ghana) with a Sickle Cell Disease trait prevalence of about 25 % and an estimated 2% of births, amounting to approximately 15,000 babies born with Sickle Cell Disease annually (Ohene Frimpong, 2010) Sickle Cell Disease is no doubt an issue of paramount public health concern in our setting. Globally it is estimated that 5% of the world’s population have the trait and over 300,000 babies are born annually with haemoglobinopathies (mostly Sickle Cell Disease and thalassemia (WHO, 2013). Beyond the toll Sickle Cell has globally by virtue of the large number of persons living with the disease and trait, the specific complications of this disease, its chronic course and associated health needs as well as the socio-economic and policy implications of this haemoglobinopathy make it should make it an issue of paramount public health interest which deserves a lot more attention than it is currently being accorded. There is only so much persons living with Sickle Cell Disease and our friends/family can do on our own. 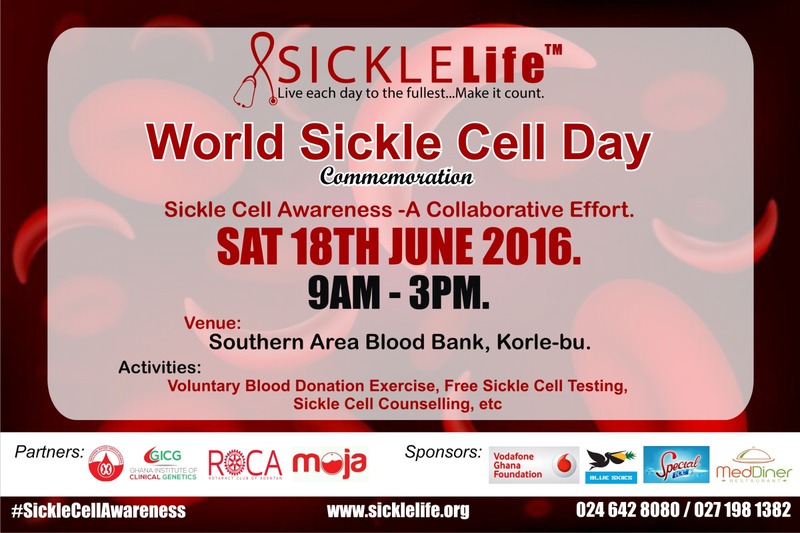 Join Sickle Life on Saturday June 18th to donate blood to support persons living with Sickle Cell Disease in commemoration of World Sickle Cell Day 2016. Blood plays an important role in the management of Sickle Cell Disease. It is useful in treating acute and chronic Sickle Cell related condition such as severe anaemia due to aplastic crisis and kidney failure respectively and managing severe complications of Sickle Cell Disease. Blood transfusion may also help in preventing or lowering the risk of strokes in children living with Sickle Cell Disease amongst many others. These occur because transfused blood increases the number of normal Red Blood Cells (hbA) in the body, causing more oxygen to be carried round the body. While reducing the amount of hemoglobin S (hbS) Red Blood Cells in the patient. This causes a reduction in haemoglobin S containing cells (sickled cells) in the bloodstream, hence are less likely to build up and block blood vessels. Blood transfusions are not used for routine care and are thus very necessary when requested. Having blood available when needed saves lives. Further, in line with Sickle Life’s mission to empower people to make informed choices, FREE sickling and Hb electophoresis testing will be carried out at the venue. A sickling test is an important screening tool for Sickle Cell Disease but is inadequate to make an informed life choice. Come interact with persons living with Sickle Cell Disease and ask health personnel from Sickle Life all your Sickle Cell Disease related questions. There will be lots to eat and drink and a lot of fun activities to engage in. Invite a friend/partner and get tested together. Be the change you want to see in the world. Step out on June 18th and make an impact in the life of someone living with Sickle Cell Disease. •The National Blood Transfusion Service, Ghana. 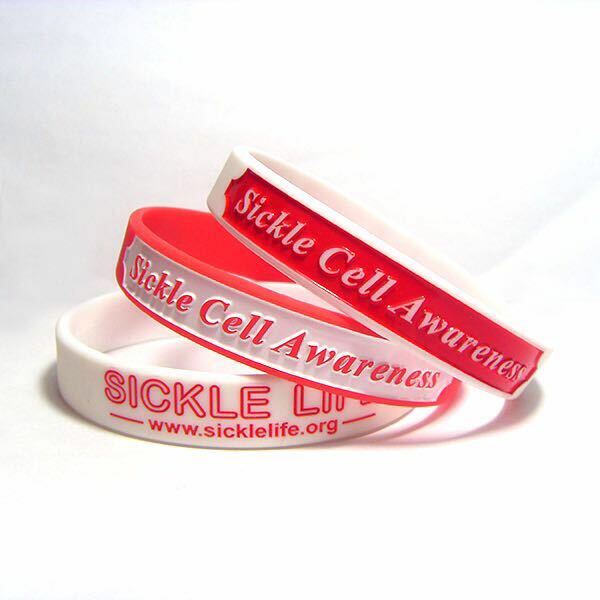 Sickle Cell Awareness wristbands still available. Show support for someone living with Sickle Cell Disease. Please buy a wristband. Written By: Dr Sefakor Enam Bankas. This entry was posted in Blog, News/media and tagged #BloodTransfusion, #SickleCellAwareness, #SickleLife, #WorldSickleDay, Ghana, June19, sickle cell disease. Bookmark the permalink. 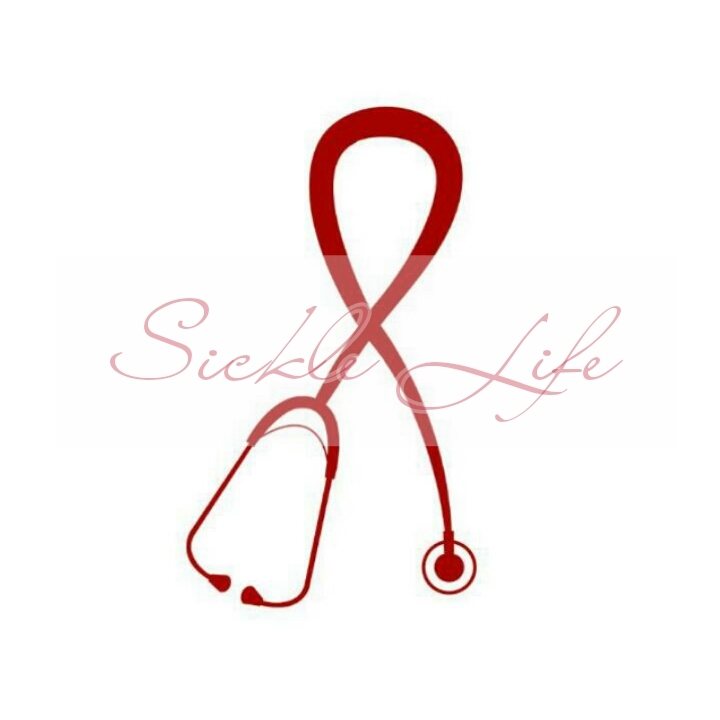 ← Do You Know About Sickle Cell Disease? I leaves in the northern region, Bole to be précised. wish to be apart of this wonderful initiative of reaching out through advocacy and the education of others on sickle cell by becoming a member of the sickle life.